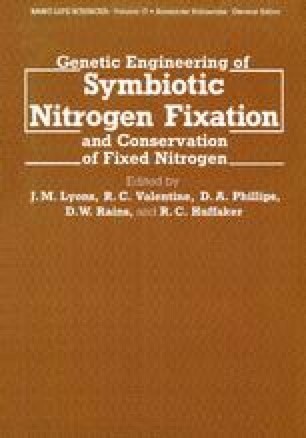 The supply of energy may often be a rate-limiting step in symbiotic N2 fixation and plant productivity (Hardy and Havelka, 1975). The efficient use of metabolic energy during N2 fixation should involve recovery and utilization of the hydrogen that is generated by nitrogenase. It has been demonstrated that several agronomically important Rhizobium spp. do not have an active H2 uptake system (Schubert and Evans, 1976; Lim, 1978), suggesting that a significant portion of the energy supplied by the host plant may be lost via nitrogenase-catalyzed H2 evolution. One method of enhancing the N2 fixation of legumes would be to introduce hydrogen uptake (hup) genes into Rhizobium strains that lack hup activity.